Here’s the deal. I had half a day to “complete” Plainville. It was then or… never. Okay, not never never, but since one of my remaining things to do in town is only open on weekdays, it would have been a while. 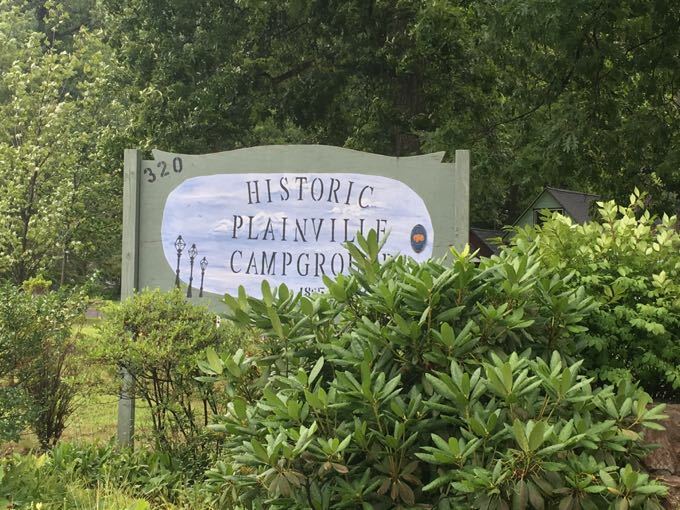 And so I set out in a driving rainstorm to hike two properties and finish up here, at the Historic Plainville Campgrounds. But it wasn’t the rain that limited my picture-taking. It was my psyche. I have never liked to take pictures in places that feel like I’m intruding or distracting. That included this place. I don’t want to be that guy. Fortunately, my friend Johnna isn’t afraid to by that girl. So I’ve taken some of her pictures from her excellent The Size of Connecticut blog. Thanks Johnna! (I was driving and photographing and trying to remain inconspicuous.) But that’s neither here nor there. You’re likely wondering why I’m including this place on CTMQ. And that would be fair. So let’s dive in and find out what this rather unique little neighborhood is all about. The Plainville Campgrounds, a grouping of summer cottages, is a good example of the organized religious campgrounds of the 19th century. Every summer, from 1865 to 1957, Methodist camp meetings were held at the Campgrounds. Camp meetings were an outgrowth of 19th century evangelism and provided a morally acceptable form of recreation. Presently run by a nondenominational association of cottage owners, the Campgrounds are no longer used strictly for religious purposes. Though once a religious property, the Plainville Campgrounds derives its primary significance as a substantially intact, architecturally distinctive complex of summer cottages, grouped in a circular fashion unique to religious campgrounds. In the Campgrounds earliest days, just after its founding in 1865, tents were pitched around a central platform which stood where the Auditorium now stands. 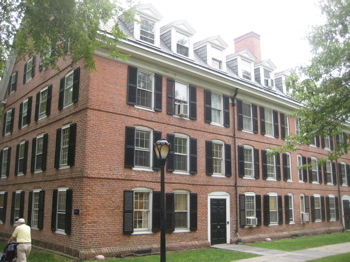 The Auditorium constructed in 1902, is now surrounded by 19 large, 2-story cottages, built by the New Haven District churches to house their members attending the summer meetings. 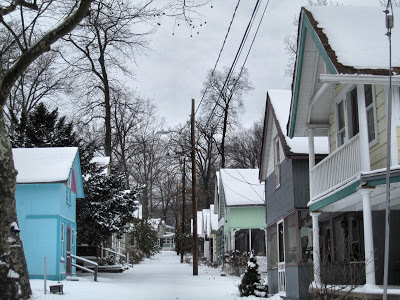 Along six avenues radiating from the Circle to the north are numerous, smaller, 1- and 2-story cottages. 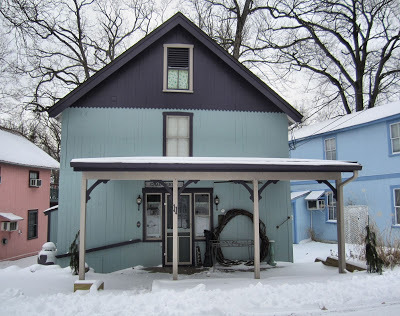 Simple frame structures, the cottages all have gable roofs and 1- or 2-story porches and are decorated with fanciful lathe-turned and jig sawn woodwork; most are sided either with vertical boards or tongue-and-groove paneling. 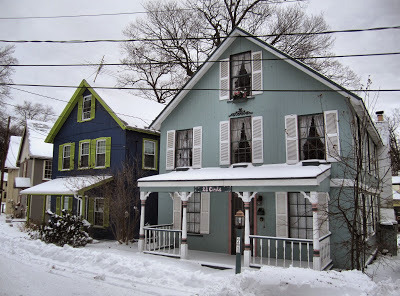 Most of the cottages date from the 1880s through 1910, with a handful of structures (26 Clinton and 37 Bristol and 27 Meriden) which may date as late as 1925. Intended for summer use only, the cottages were not built to a high standard of structural integrity. Very few have been altered in any significant way, either through the removal of original fabric or the addition of incompatible modern elements. You can tell which picture’s aren’t from my visit in July. The Campgrounds follows the traditional circular configuration of camp meetings, which again originated as a circle of tents ringing a roughly-constructed preaching platform. I’d suspect many people driving down Camp Road every day a) don’t know why it’s named Camp Road and b) have never driven in to the little one-way streets campground. It’s a really cool place. The only other similar thing in Connecticut that I’m aware of is the Willimantic Camp Meeting Association, which still retains the religious aspect. There may be others; I’m not sure. Let’s learn some more, from the Campgrounds’ 2015 Open House brochure. In 1865 a spirit of religious revivalism swept the nation in the aftermath of the Civil War. With this spirit, the New Haven District of the Methodist Church purchased farm land in Plainville, Connecticut to hold revival meetings. I suppose no one thought about why a just god had just allowed slavery and mass carnage, but whatever. Humans gotta human. At first these meetings were held in an open field in the center of the Campgrounds, with people living in tents surrounding the area. A train station was erected on Camp Street and local farmers would provide rides to the area with horses and wagons. At times, over 3,000 people would attend the revivals. Eventually, beginning in the 1900’s a covered auditorium (1902) was built as well as an Administration Building. The member churches also began to construct buildings around the tabernacle. 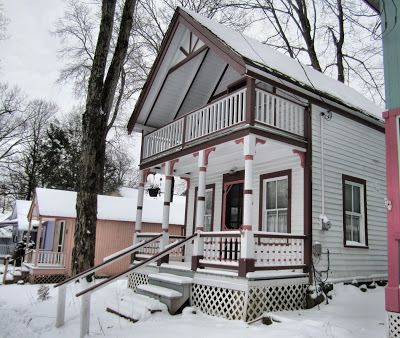 In the early 1900’s, individuals began to erect cottages in a spoke-type pattern radiating out from this central core and people began to spend larger periods of time in the Campgrounds, even when a revival meeting was not being held. movement), Seventh Day Adventists, Forestville Camp and Bible Conference, and most famous of all the Connecticut Chautauqua. 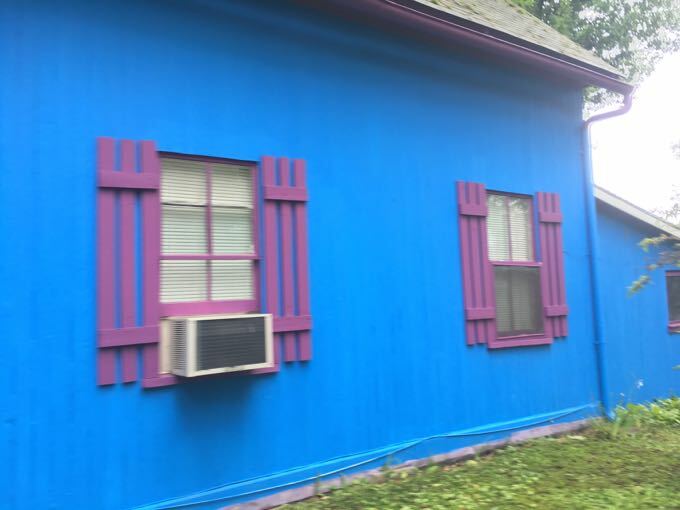 In the mid-20th Century with the advent of television and widespread automobile ownership, the revival movement began to fade and in the late 1950’s the Methodist Church sold the land to a group of cottage owners who had formed the Plainville Camp Grounds Association. The Association petitioned to have the Campgrounds declared a National Historic Site and was granted recognition in 1980. Over the years because of some neglect in the 1940’s and 1950’s, some cottages had to be torn down, but the ones that remain have been maintained and improved by the owners. 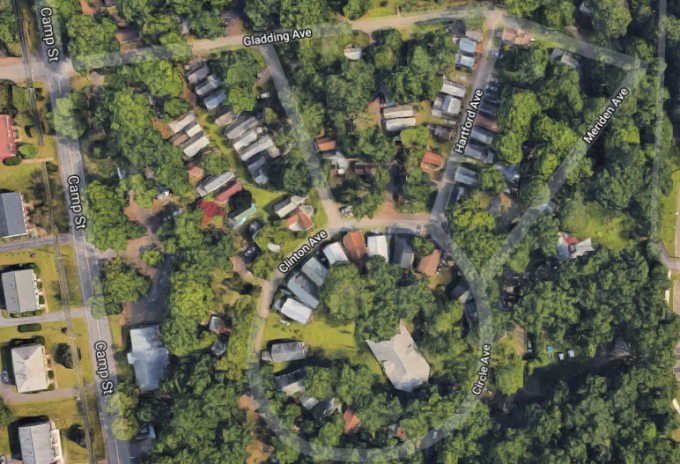 Presently 87 cottages exist which are privately held on land owned by the Plainville Camp Grounds Association. These cottages are seasonable and can only be occupied from May 1 thru October 31. Ah. Now I know why Johnna didn’t feel weird taking pictures there. She’s smarter than I am. The Campgrounds are governed by a Board of Directors elected by the owners. The Campgrounds have running water and sewers and the owners enjoy a variety of activities. 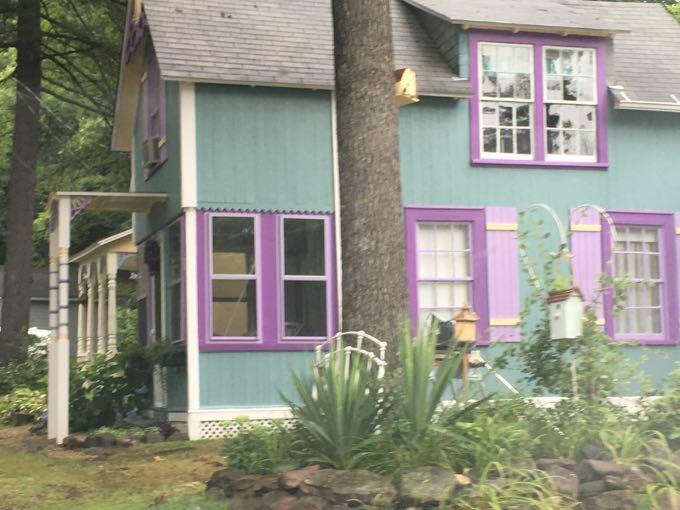 These cottages (which some call “the painted ladies”) are a wonder to behold and are truly a hidden gem in central Connecticut. This is true. Many are quite beautiful and quite unique. 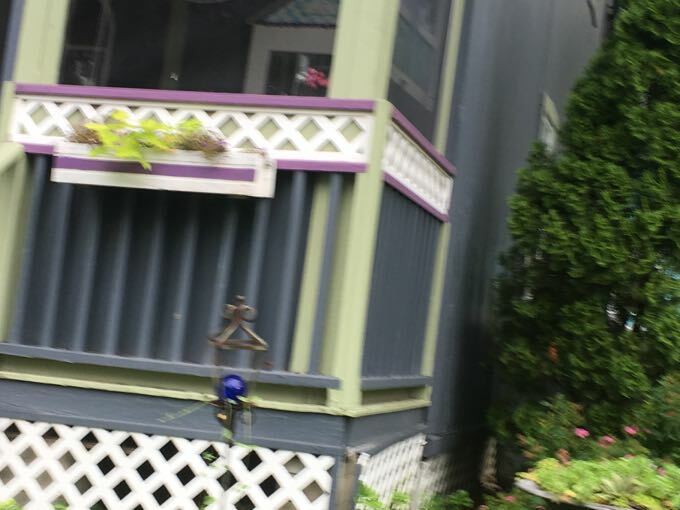 If you were to paint your house like these cottages, your neighbors would hate you. Here? The are celebrated and encouraged. (Which, now that I think about it, isn’t very Methodist of them at all. Though I’m only familiar with Baptists and Presbyterians, though my mother was a Lutheran. I suppose no one thinks about why the one true god is worshiped through so many different denominations, but whatever. Humans gotta human. You should have visited in 2015 when they celebrated their anniversary and opened the campgrounds to the public. They scheduled several events that summer including tours inside several of the cottages. It really is a cool place to explore.